Remove the corruption from the ruins of Tanzelwil. Strange stones emanating necromantic energy have appeared on the sacred grounds of Tanzelwil. Priestess Langwe believes they might be tied to the disturbed demeanor of the Ancestral Spirits. 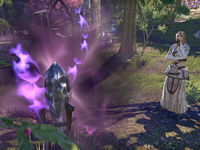 Get the Altmer Holy Symbol from Priestess Langwe. Destroy each of the 4 Corruption Stones scattered around Tanzelwil. Find Langwe again at the entrance to the ruin. Speak with Priestess Langwe in Tanzelwil who will be studying the nearby stone. "Careful, don't get too close to the stone! It appears to be emanating dark necromantic energies." "I'm not entirely certain. But it does look menacing, doesn't it? These stones appeared overnight, at key locations throughout the ruins. It's no coincidence that the ancestral spirits went mad that very day. I'm certain there's a connection." It certainly doesn't look natural. "No, it doesn't, does it? There are dark forces at work here. I have a powerful Altmer Holy Symbol used for blessings at this site. I thought I might try using it on the stone, but I'm afraid I haven't the nerve. Would you be willing to try it?" Langwe gives you the Altmer Holy Symbol, which you must use on the nearby Corruption Stone. Using it on the stone results in the stone being destroyed. Once this stone is destroyed, speak again with Langwe. "My gods, it worked! You've destroyed the stone!" What should I do with your Holy Symbol? "Keep it, for the time being. You may need it. If any more of these stones turn up, I'll find you. In the meantime, I should inform the Queen of our progress." You must now destroy four more Corruption Stones scattered around the ruins of Tanzelwil. One is located in the south-western corner, and three in the norther section of the ruins. The locations are marked on your map. Go to all four stones, and destroy the crystals using the Altmer Holy Symbol. Once all four have been destroyed, return to Langwe, who has moved to the north-western corner of Tanzelwil. "What fascinating artifacts these stones are. I wonder where they came from?" Do you want your Holy Symbol back? "Not until the last of the stones has been destroyed. Only one remains, as far as I can tell." The final crystal is next to Langwe. Use the holy symbol on it, and a flash of light fills your vision; the spirits in Tanzelwil have been made docile, and will no longer attack unless provoked. Speak with Langwe again to finish the quest. "Something's happened. The spirits appear to be growing docile again." "You've done it! The madness has left them, and the Ancestral Spirits are at peace. I can still sense residual necromantic energy, so be careful. The stones were powerful. We may feel their influence for some time to come." You will then receive some gold and a pair of Monastic Slippers. As you explore Tanzelwil, you can find four notes (Instructions for Placement, On Activation, On the Holy Symbol, and Susceptibility to Corruption) written by Norion, confirming that he is responsible for the corruption. 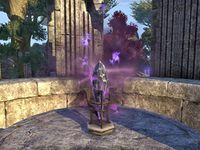 Priestess Langwe provided me with an Altmer Holy Symbol to use on the mysterious stone. The Altmer Holy Symbol destroyed the mysterious stone. I should speak with Priestess Langwe to discuss our strategy for destroying the remaining stones. Priestess Langwe has asked me to seek out and destroy the mysterious Corruption Stones located throughout Tanzelwil. I should seek out Priestess Langwe and inform her that I've destroyed the Corruption Stones. Priestess Langwe located one last Corruption Stone. I should use the Altmer Holy Symbol to destroy it. Finishes quest I have destroyed the last Corruption Stone at Tanzelwil. I should confer with Priestess Langwe. This page was last modified on 10 April 2019, at 07:05.